Black half round gutter/rainwater system is a practical, easy to install the system. Offering a cost-effective solution for both new build and refurbishment applications. Compatible with most major manufacturers. Description: Stylish Gloss Black Half Round guttering, 4m long x 112 mm wide x 52mm depth. Should be fitted at 1:350 fall for optimum flow rate. Manufacturer: Colour: Black .. Description : Stylish Gloss Black Half Round guttering, 2m long x 112 mm wide x 52mm depth. Should be fitted at 1:350 fall for optimum flow rate. Manufacturer : Colour : Black . .. Description: 68mm Gloss Black 2.5 m long downpipe fits straight onto fittings. Colour : Black Dimensions : 68mm diameter x 2.5m length Want to order by telephone. We are here to help. Please call 01179719922 Weekdays 8 am - 4.30 pm We deliver .. Description: 68mm Gloss Black round 4 m downpipe fits straight onto fittings Manufacturer: Colour: Black Dimensions: 68mm diameter x 4m length Want to order by telephone. We are here to help. Please call 01179719922 Weekdays 8 am - 4.30 pm We .. Description: 68mm Gloss Black round 5.5 m downpipe fits straight onto fittings Manufacturer: Colour: Black Dimensions: 68mm diameter x 5.5 m length Want to order by telephone. We are here to help. Please call 01179719922 Weekdays 8 am - 4.30 pm .. Description: 68mm Gloss Black 5.5m long down pipe, fits straight onto fittings Manufacturer: Colour: Black Dimensions: 68mm Diameter x 5.5m Long .. Description : Gloss Black In-Line Running Outlet for use with Floplast 112mm Half Round Guttering, connects to Floplast 68mm Downpipe. Both sides fitted with Rubbers and Clips for a water tight seal. Manufacturer : Colour : Black . .. Description: 112mm Gloss Black StopEnd Outlet, gets pipes in close to walls. For use with Floplast 112mm Half Round Gutter and 68mm downpipe. There is a fixing point on each side which are to be drilled out on which ever side you want to fix it on. Manufacturer:&nbs.. Description : Gloss Black Internal Stop End for 112mm Half Round Gutter, these fit into the ends of Union joints or Running Outlets. PLEASE NOTE: These do NOT fit into the gutter, use External Stopend to fit directly on to 112mm Half Round Gutter.. Description: 112mm Gloss Black Half Round Gutter External Stop End, fits directly on to the end of Floplast 112mm half round guttering. They are fitted with rubber and clip for a watertight seal. Colour: Black .. Description: Gloss Black 112 mm Gutter Union / Joint, allows 112mm Half Round guttering to be joined together in a straight line. Each unit has 3 fixing points, to allow easy installation, and no need for gutter support brackets either side. Fitted wit.. 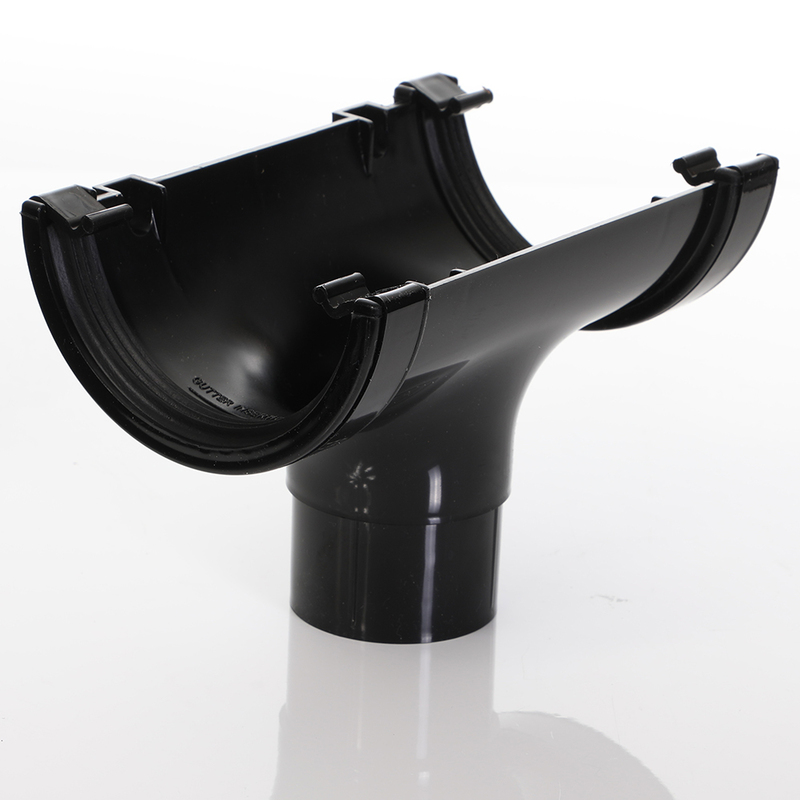 Description 115mm Deep Flow To 112mm Round Gutter Converter Colour Black Want to order by telephone. We are here to help. Please call 01179719922 Weekdays 8 am - 4.30 pm We deliver nationwide normal delivery time 1-2 days for this product. More Brown Deep Guttering Clic.. Description : This Gloss Black 90º Gutter Angle joint, allows you to take your guttering around a internal or external corner of 90º. It is fitted with rubbers and clips at each end for a water tight seal. This corner joint requires gutter clips to be fi.. Description: This is a 135º corner joint for use with 4m 112mm black guttering, it can be used for both internal and external corners. With rubber seals and clips to form a water tight seal when fitted, gutter clips will be needed to be fitted to the gutteri.. Description: A new and innovative two section design of this product allows flexibility where never before thought possible. No more waiting for special angles to be fabricated- and no more hold ups on the job. Flexibility on the shelf and when you want it! Perfect on conservatories .. Description : Used to join plastic 114mm square gutter onto plastic 112 mm Half Round guttering Manufacturer : Colour : Black .. Description : Gloss Black Gutter Brackets for use with 112mm Half Round Black Gutter - (place at max 1 metre centres) Manufacturer : Colour : Black . .. Description : Gloss Black Half Round 112mm Gutter converter, this allows you to connect Half Round 112mm Guttering to existing half Round Cast Iron guttering. Fitted with a rubber and clip at the end for the gutter and 2 clips and a nut and bolt to attached the cast iron sid.. Description: 68mm Gloss Black round downpipe joiner for use with Floplast 68mm Round Downpipe Colour : Black Want to order by telephone. We are here to help. Please call 01179719922 Weekdays 8 am - 4.30 pm We deliver nationwide normal delivery time 1-2 days for.. Description: 68mm Gloss Black Round Downpipe 67.5º Branch, for use with 68mm Downpipes Colour : Black Want to order by telephone. We are here to help. Please call 01179719922 Weekdays 8 am - 4.30 pm We deliver nationwide normal delivery time 1-2 days .. Description: 112 degrees offset downpipe bend for use with 68mm downpipes. Normally bought in pairs and used to bring the downpipe from the running outlet in towards a wall and then back to a vertical position. Manufacturer : Colour: Black Want to order .. Description:68mm Gloss Black Round 92.5 degree offset downpipe bend for use with Floplast 68mm round downpipe. Colour: Black Want to order by telephone. We are here to help. Please call 01179719922 Weekdays 8 am - 4.30 pm We deliver nationwide normal delivery t.. Description: Gloss Black Round 68 mm Down pipe clip standoff, for use with Floplast 68mm Round Downpipe Colour: Black Want to order by telephone. We are here to help. Please call 01179719922 Weekdays 8 am - 4.30 pm We deliver nationwide normal delivery time 1-2 days for .. Description: 68mm Gloss Black Round downpipe shoe/spout for use with Floplast 68mm Downpipes Colour: Black Want to order by telephone. We are here to help. Please call 01179719922 Weekdays 8 am - 4.30 pm We deliver nationwide normal delivery time 1-2 days for t.. Description : Give your downpipes a more traditionally classic look with this Gloss Black Down Pipe Shoe with fixing lugs, fits 68mm round downpipe, and to finish off the look why not use the 12 gauge x 50nn stainless steel Black Capped fixings (FC50 - sold in pac.. Description: Round Gloss Black 68mm Downpipe Access Pipe. Used to allow access to downpipe for blockage inspection without the need to access from the top. Colour: Black .. Description: Traditionally Classic Gloss Black Down pipe clip with fixing lugs add that traditional finishing touch to your downpipes, and to complete the effect why not use FC50 fixings (see link below) Colour: Black .. Description : Why not give your downpipes a traditioanlly classic look when joining downpipes together, with these Gloss Black Pipe socket with fixing lugs, and finish off the effect by using 12 gauge 50mm stainless steel balck cap fixings (FC10) - (sold in packs o.. Description: Gloss Black Universal hopper head fits 65mm square or 68mm round downpipes. With two pre-formed fixing points to allow easy installation. Maximum flow rate 1.14 liters/second. Colour: Black Want to order by telephone. We are here to help. P.. Description : This 68mm Spigot to 50mm Spigot in Gloss Black allows you to convert down from a 68mm downpipe to a 50mm mini downpipe. Manufacturer : Hunter Colour : Black ..